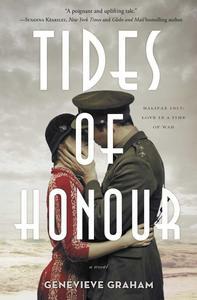 Set against World War One and the the Halifax Explosion, Genevieve Graham's new novel, Tides of Honour, a story of love, loss, and honour, is quintessentially Canadian. But what does that mean, exactly? Well according to research by Graham herself, it means everything. Quintessentially Canadian is huge and splendiferous, from oddball to awesome, and Graham celebrates its variousness in the books list below. I never used to think about where authors lived, what country they represented. Unless an author was writing something specifically themed to a country, then I couldn't see how citizenship might affect the writing. Writing, to my way of thinking, represented the thoughts of the writer, no more than that. Then I started up my editing business and noticed a definite trend. I have edited for dozens of authors around the world, and while excellent writing (and poor writing, for that matter) can be found anywhere, I generally find something special in my compatriots' work. Something unique and distinctly Canadian. So who, from this vast, eclectic country do I enjoy reading? Well, like almost everyone else studying English in high school, I read Laurence, Atwood, and Ondaatje, but nowadays my taste tends to run to historical fiction. I am smitten with Ami McKay's writing. Both The Birth House and The Virgin Cure were beautifully and meticulously researched, the stories communicated with a kind of pure, hypnotic ease. Her characters are tragic and inspiring, and though the reality of them is in the past, they feel as accessible as the girl next door, only much more intriguing. It came as somewhat of a surprise to me to discover the great Susanna Kearsley is Canadian. She has a string of beautiful historical time travel novels that continue to be extremely successful in the international commercial literary world. Once again, her books are fabulously researched, going so far as to include the wall colours of actual buildings she has visited, the number of steps between this site and that. Not only does she write elegant, intriguing historicals, she effortlessly blends time so the appealing modern day heroine comes alive simultaneously in both worlds. As an added bonus, quite a few of her female antagonists are writers, meaning I have actually experienced the character—and therefore Ms Kearsley—sinking into that mystical writers' trance I love so much. On the darker side, I enjoyed Sara Gruen's Water for Elephants. And again, the main character shares insight from two different time periods, though it is just Jacob at different ages. I loved the originality both of story and characterization, and really, what better place to find entertaining characters than in a wandering circus? A seamier, less considered edge of that tumultuous time period (1930s) came alive for me through Ms Gruen's writing. Great read. And while I'm a little sorry I went to see the film version of Water for Elephants, I'm really glad I got to see Yann Martel's Life of Pi on the big screen. I will admit that I like a straightforward story and am not one to voluntarily delve into literary devices, but even I was blown away by the levels built into this fantastical story. Who is Richard Parker? What's with the meerkats? Though I felt a little unfulfilled by the story, in the end I couldn't help but admire the sheer artistry of the prose. Once in a while, when I need a little break from the past, I'll pick up something with an eye-catching title or cover, and I'll be really glad I did. One of those was Jessica Grant's Come, Thou Tortoise. I'll admit it: at first I just loved the title. And the cover. I liked the novelty of telling people I was reading something called Come, Thou Tortoise. Pretty soon, though, I had to stop telling people, because I was too deeply buried in the novel. It was as ridiculous as it was profound, and sometimes both happened within the same sentence. Oddball Audrey had me completely confused in the beginning and completely infatuated by the end. So did the tortoise. I've just started reading Angie Abdou's The Bone Cage, and I am not surprised at its selection for Canada Reads a few years back. Ms Abdou's writing is clean, accessible, and real, with characters that aren't particularly straightforward. I'm still not sure exactly how I feel about them, but I'm intrigued. I'd like to give a shout-out to my friend and mentor, Rona Altrows, who won the City of Calgary W.O. Mitchell Book Prize for A Run On Hose. If you haven't picked up one of Rona's books, you really should. Rona tells it like it is in a series of short stories about every day life and living through it, speaking from the perspectives of women of all ages and stages. Poignant, funny, and just plain honest. Now that I'm living in Nova Scotia, it seems to me the land has tilted slightly, jostling so many creative people to this coast. This article gives me a great opportunity to mention some of the fantastic authors I've met out here, like Pamela Callow (thrillers), Julianne MacLean (women's fiction), Donna Alward (Harlequin at its finest), and Lesley Crewe—whose debut novel, Relative Happiness, is now a feature film. Genevieve Graham graduated from the University of Toronto with a degree in music in 1986 and began writing in 2007. Her first three novels, Under the Same Sky, Sound of the Heart, and Somewhere to Dream, were international bestsellers. Graham is passionate about historical adventure, runs an editing business, and teaches piano. She lives in Halifax, Nova Scotia.